Hippolyte Mège-Mouriès (Draguignan 24 October 1817 – Paris 31 May 1880) was a French chemist and inventor. Although he made a number of important contributions, the one for which he is famous is the invention of margarine. Hippolyte Mège was born on 24 October 1817 in Draguignan to Jean Joseph-Emmanuel Mège, and his wife Marie Marguerite Mouriès. The son of a primary school teacher, he added his mother's surname to his own around 1850 to distinguish himself from others of the same last name. Legal documents, however, often used "Mège". In 1838, Mège obtained a job as a pharmacist in the central pharmacy of the Hôtel-Dieu hospital in Paris. 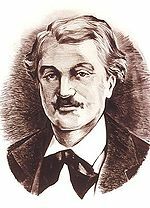 Mège started to publish original contributions in applied chemistry, such as a form of the syphilis medicine Copahin refined with nitric acid. that eliminated side-effects. He also obtained patents for effervescent tablets, for techniques in paper making and sugar refining, and for the tanning of leather using egg yolks. By 1852, Mège-Mouriès was studying the chemistry of foods. He added calcium phosphate and protein to chocolate in an attempt to make it healthier. By 1855, Mège-Mouriès was studying bread. In addition to examining the coloration of bread, he developed a way of making bread that allowed bakers to produce 14% more bread given a fixed amount of ingredients. This was a major achievement, arousing international interest in France, Germany, and Britain. His work was a topic of great interest at the Royal Society of Arts in London.Eliza Acton discussed his new discoveries in detail in The English Bread-Book For Domestic Use (1857). Mège-Mouriès received two gold medals for his work. In 1861, Napoleon III awarded him the Légion d’Honneur for his work on panification. In the 1860s Mège-Mouriès focused on fat processing. France was experiencing a butter shortage, and Napoleon III offered a prize for producing a butter substitute. Mège-Mouriès experimented with what was believed to be a new fatty acid discovered by Michel Eugene Chevreul, acide margarique or margaric acid. By 1867, Mège-Mouriès was working at la Ferme Impériale de la Faisanderie, Napoleon III's private farm in Vincennes near Paris. "A fatty body identical in chemical composition with butter is obtained from fresh suet by crushing it between rollers under a stream of water, further washing it and then digesting it with agricultural gastric juice. The fat is extracted, melted, passed through a sieve and poured into boxes to set, after which it is cut into pieces, which are wrapped in cloths and pressed between hot plates. A fatty body is expressed and may be agitated in a closed vessel, cooled, cut up, bleached with acid and washed with water. This purified fat is mixed at animal heat (104°F) with water containing small quantities of bicarbonate of soda, casein of cold milk and mammary tissues along with yellow coloring matter. This is digested, allowed to settle, decanted and cooled and yields a preserved butter. Fresh butter is obtained by agitating the above mixture until a cream is formed, which is then treated as usual to obtain the butter." Although he did not correctly understand the chemistry involved, the Mège-Mouriès process was a significant achievement in that he successfully rendered a bland, neutral fat at low temperatures, using water, and discovered that working fat and milk together gave the result a flavor similar to butter. His process resulted in a cheap but qualitatively good substitute for butter for the working class and incidentally the French Navy. Mège-Mouriès received a prize in 1870 from the French government, formally led by Emperor Louis Napoleon III. He attempted to start a manufacturing facility at Poissy, but the enterprise floundered because of the Franco-Prussian War. Mège-Mouriès applied for a number of patents for the process of making margarine. French patent (brevet) No. 86,480 for "production de certains corps gras d'origine animale" was filed on 15 July 1869.:419 It was granted on 2 October 1869 for a period of fifteen years. Mège-Mouriès also received an English patent on July 17, 1869, and one for Austria on October 31, 1869. Patents were obtained for Bavaria on April 8, 1873, and Patent 146012 for the United States on December 30, 1873. This did not protect him from competitors in all countries. In 1869, the Netherlands repealed its Patent Act of 1817. In 1883, the Paris Convention attempted to regularize the rights of all signatory countries, but the Dutch did not pass a new patent act until 1910. From 1869 to 1912 the Netherlands effectively lacked patent agreements. In the absence of a Dutch legal framework that defined patent rights, Mège-Mouriès could not claim, assert or sell such rights. He could not apply for a patent, establish a monopoly, or license others to do so in the Netherlands. Accounts differ as to exactly how Mège-Mouriès' process was acquired by the Dutch. Butter suppliers such as Jurgens and van den Burgh had been exporting large amounts of butter to England and other countries for decades. Now, they were no longer required by reciprocal agreements to respect the margarine patents granted to Mège-Mouriès in other countries. Mège-Mouriès showed his invention to Dutch butter exporter Antoon Jurgens in 1871. He may have been paid a compensatory fee. Mège-Mouriès may not have realized that his patent was not protected in the Netherlands by patent agreements when he demonstrated his techniques to Jurgens. Alternatively he may have understood the difficulty of maintaining control of his invention given the lack of a Dutch patent law, and decided to accept a compensatory fee for sharing his knowledge. A number of sources state that he sold his patent rights to Jurgens, but what this could mean is unclear given the absence of Dutch laws governing the definition, ownership, transfer and enforcement of patent rights at the time. It would be more accurate to say that he sold his knowledge of the process. Untroubled by patent restrictions, Jurgens developed Mège-Mouriès's ideas further and began to manufacture and sell margarine, as did another Dutch company under Simon van den Bergh. Both were located in Oss in North Brabant. Jurgens' company eventually became part of Unilever. Mège-Mouriès made very little profit from the invention of oleomargarine, which never became popular in France. Jurgens and van den Bergh created a substantial export industry, selling margarine to England and other countries, as did a number of smaller competitors. In the 1880s there were at least 70 margarine factories in the Netherlands. In 1911 Jurgens exported 111,000 tons of margarine, and Van den Bergh 112,000. Hippolyte Mège-Mouriès died on May 31, 1880. He was buried near his wife and son, in Père Lachaise Cemetery in Paris. ^ a b c d e f Glorfeld, Jeff (31 May 2018). "This week in science history: Margarine inventor's fame spreads". Cosmos: the science of everything. Retrieved 17 July 2018. ^ Tissot, Janine. "Hippolite Mège-Mouriès". Les Actus DN. Retrieved 18 July 2018. ^ a b c d e f g h List, Gary R. "Giants of the Past: Hippolyte Mège Hippolyte Mège (1817-1880)". The American Oil Chemists’ Society. Retrieved 17 July 2018. ^ Mège-Mouriès, H. (1871). "On wheat and wheaten bread". In Chandler, Charles Frederick; Chandler, W. H. The American chemist. 1. New York: William Baldwin & Co. pp. 22–23. ISBN 978-1231734100. Retrieved 18 July 2018. ^ Ure, Andrew; Hunt, Robert (1871). A supplement to Ure's Dictionary of Arts, Manufactures, and Mines V2: Containing a Clear Exposition of Their Principles and Practice. New York: Appleton & Co. p. 196. Retrieved 17 July 2018. ^ Royal Society of Arts (Great Britain) (January 3, 1868). "Mège-Mouriès process for the manufacture of flour and bread". Journal of the Royal Society of Arts. 16: 104–105. Retrieved 17 July 2018. ^ "The varieties of bread". Pure Products. II (1): 18–20. January 1906. Retrieved 18 July 2018. ^ Acton, Eliza (1857). The English Bread-Book For Domestic Use. London: Longmans, Brown, Green, Longmans & Roberts. pp. 192–197. ISBN 9781230325798. Retrieved 18 July 2018. ^ "Decret imperiale". Bulletin des Lois. Partie Supplémentaire: 1014. 1861. Retrieved 18 July 2018. ^ "Chronique Agricole". Journal d'Agriculture Pratique. 25 (1): 57–59. 20 January 1861. Retrieved 18 July 2018. ^ a b c Dalton, Louisa (August 16, 2004). "Margarine". Chemical & Engineering News. 82 (33): 24. doi:10.1021/cen-v082n017.p024. Retrieved 17 July 2018. ^ a b c Shurtleff, William; Aoyagi, Akiko (12 August 2015). History of Soybeans and Soyfoods in the Netherlands, Belgium and Luxembourg (1647-2015): Extensively Annotated Bibliography and Sourcebook (PDF). Lafayette, CA: Soyinfo Center. p. 419. ISBN 9781928914792. Retrieved 18 July 2018. ^ "Business & Finance: Margarine". Time. September 8, 1924. Retrieved 17 July 2018. ^ McGee, Harold (1984). On food and cooking : the science and lore of the kitchen (PDF). New York: Scribner. p. 37. ISBN 978-0684181325. Others before Hippolyte Mège-Mouriès had modified solid animal fats, but he had the novel idea of flavoring beef tallow with milk and working the mixture like butter. ^ a b c d Snodgrass, Katherine (December 1930). Margarine as a Butter Substitute. Stanford University, CA: Food Research Institute. pp. 125–129. Retrieved 17 July 2018. ^ Roberts, Jacob (2014). "Butter-in-Law". Chemical Heritage Magazine. 32 (1): 18. Retrieved 17 July 2018. ^ a b McLagan, Jennifer (2008). Fat : an appreciation of a misunderstood ingredient, with recipes. Berkeley, Calif.: Ten Speed Press. pp. 18–19. ISBN 978-1580089357. Retrieved 18 July 2018. ^ France. Office national de la propriété industrielle (1869). "Brevet No 86480, en date du 15 Juillet 1869". Description des Machines et Procédés Pour Lesquels des Brevets d'Invention Ont été Pris Sous le Régime de la Loi du 5 Juillet 1844. 109: 12. Retrieved 18 July 2018. ^ France (3 May 1873). "No. 130, Brevets D'Invention". Bulletin des Lois de la République Franc̜aise. 6 (12): 505. Retrieved 18 July 2018. ^ Gunstone, Frank D. (2001). Structured and modified lipids. New York, NY [u.a. ]: Dekker. pp. 424, 452. ISBN 9780824702533. Retrieved 18 July 2018. ^ "Commercial Manuf'g Co., Consolidated, and another, v. Fairbank Canning Co". The Federal Reporter. 27: 81. 1886. Retrieved 18 July 2018. ^ United States department of Agriculture. Division of Chemistry (1887). "Food and Food Adulterants". Bulletin (13): 9–12. Retrieved 18 July 2018. ^ Riordan, Teresa (September 29, 2003). "Patents; An economist strolls through history and turns patent theory upside down". The New York Times. Retrieved 17 July 2018. ^ "History of the patent system". Netherlands Enterprise Agency. Retrieved 18 July 2018. ^ a b c d e f g Schiff, Eric (1971). "Chapter 5. Two Dutch industries during the patentless period". Industrialization Without National Patents The Netherlands, 1869-1912; Switzerland, 1850-1907. Princeton, NJ: Princeton Legacy Library. pp. 52–60. ISBN 978-0691647449. Retrieved 18 July 2018. ^ "Will the Dutch Patent Act Survive 2110". IPEG. Retrieved 18 July 2018. ^ Khan, B. Zorina. "An Economic History of Patent Institutions". EH.net. Economic History Association. Retrieved 18 July 2018. ^ Roney, John B. (2009). Culture and customs of the Netherlands. Santa Barbara, Calif.: Greenwood Press/ABC-CLIO. p. 36. ISBN 9780313348082. Retrieved 18 July 2018. ^ Trex, Ethan (September 5, 2010). "Butter battles margarine from beginning". Mental Floss / CNN. Retrieved 17 July 2018. ^ "Antoon Jurgens". Erfgoed Brabants. Retrieved 17 July 2018.